With everything that's been going on in my life over the last few weeks, I've been slow to get Autumn decorating done. So when I was given the chance to try some new FolkArt Stencils and Paints, I was thrilled! 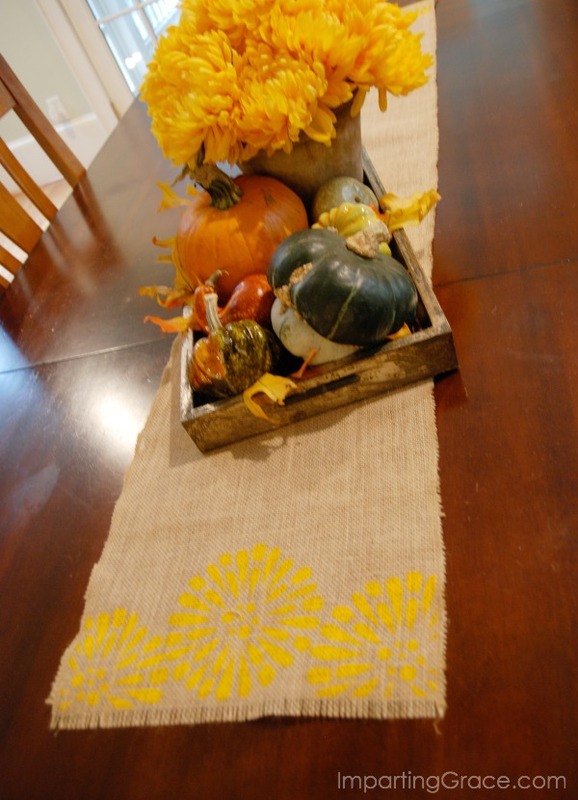 Stenciling is one of my favorite ways to create custom decor items. I got hooked on stenciling when I was a new bride and had very little money for decorating. I would use an exacto knife to cut my own stencil designs from manila file folders, stencil those designs onto scraps of unbleached muslin and "frame" them in cheap embroidery hoops. Instant art! Stenciling products have improved over the years. Stencils are now laser-cut out of heavy-duty mylar so they can be used over and over, which is a huge improvement over my exacto-knife creations! One of my favorite improvements is the development of paints that can be used on just about any surface. Another great development is specialized stencil adhesive that will hold a stencil precisely in place. 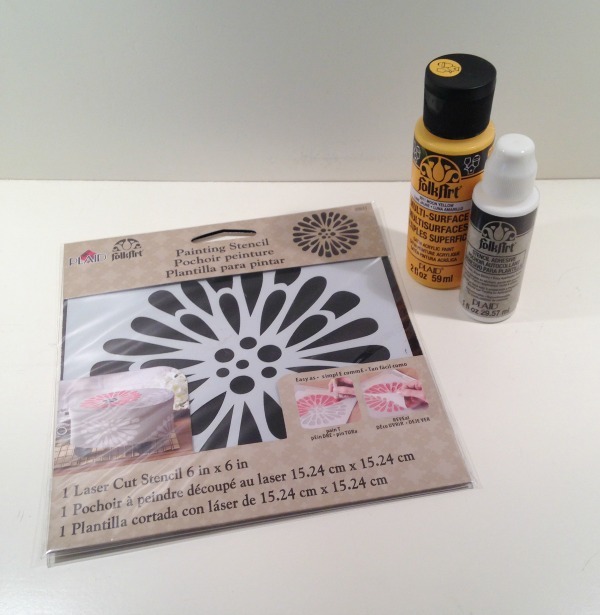 Stenciling is now so easy, anyone can do it! I was tickled to try this floral stencil. To me, the flower looks like my favorite mums. Remember when mums were the flowers in Homecoming corsages? My first creation using this stencil was a simple little chalkboard sign. I had fun placing the flower in the corner of the sign and adding an Autumn message. 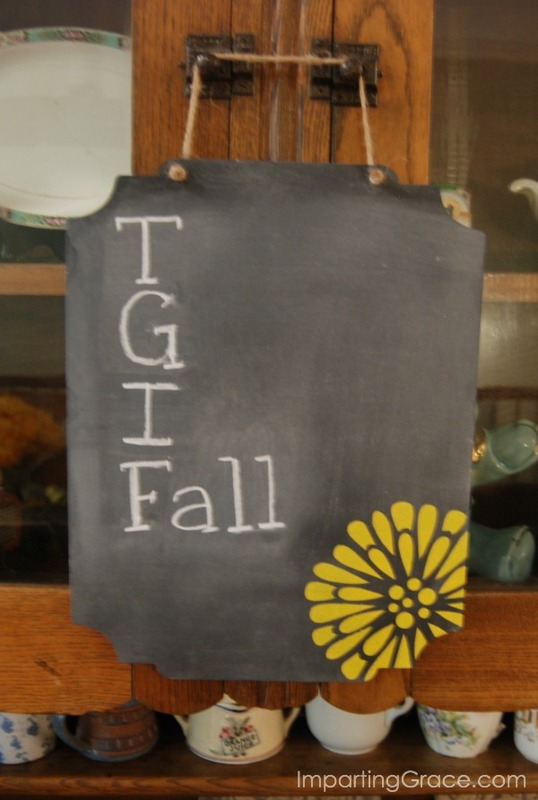 If you have any kind of chalkboard you'd like to customize for Fall, I highly recommend this little project. Simply place the stencil in the corner of the chalkboard (the stencil adhesive makes it so easy to re-position!) and daub on your paint one thin layer at a time until you reach the saturation you like. Easy-peasy! I hung the little chalkboard on my mother's dough cabinet that stands in my breakfast room. 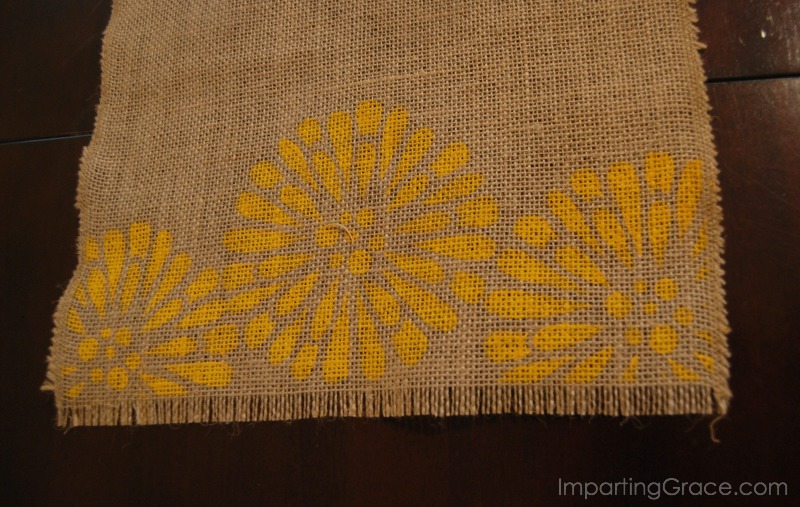 I knew the FolkArt multi-surface paint would work great on the chalkboard, but I wanted to try it on something a little more challenging, so I decided to see how it would work on burlap. 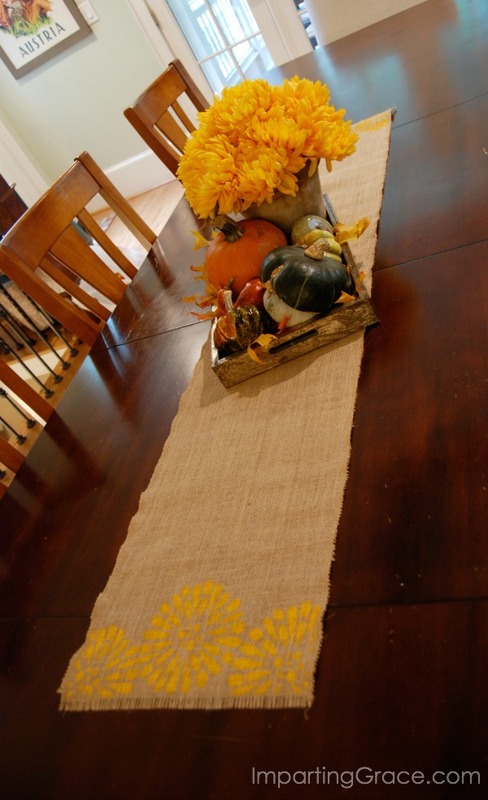 I've made burlap table runners several times before simply by cutting a rectangle of burlap and fringing the edges. 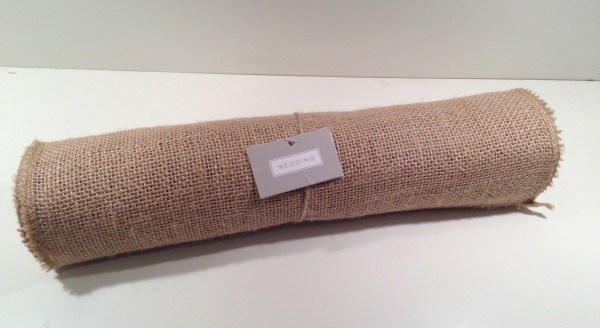 But this year I found a product that made the process super-simple: a roll of burlap runner. I simply cut a length of the burlap and removed a few threads from each end to create a fringe. In addition to the Stencil adhesive, I also used masking tape to cover up the parts of the stencil I didn't want to show up in my design. The secret to successful stenciling is getting most of the paint off your brush and daubing on one thin coat at a time. I use a paper plate as a palette for my paint. The FolkArt stencil paint is nice and thick, so it covers nicely without running. But do be careful: if you have too much paint on your brush, your design won't have crisp lines. I applied three light coats of paint on the burlap to get the coverage I wanted. 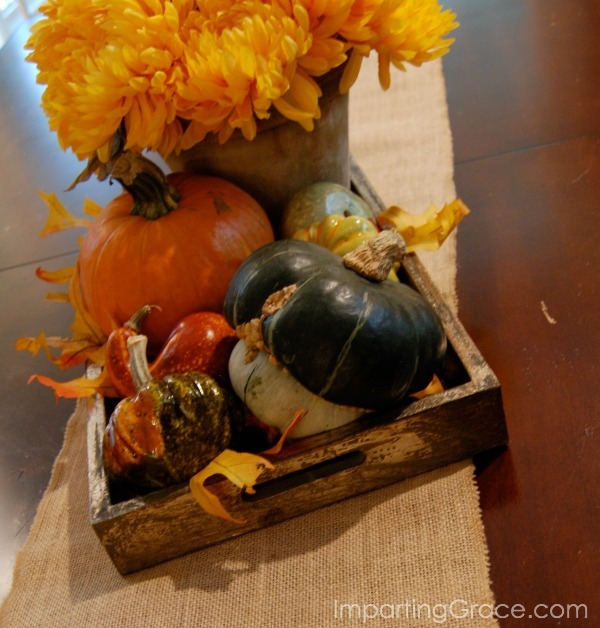 After I stenciled both ends of my runner, I made a simple centerpiece by placing a pot of mums and some pumpkins and gourds on a tray. Super-easy and so pretty! Since FolkArt Multi-Surface Paints come in a huge variety of colors and work on just about any surface, creating cute, custom decor couldn't be easier. And the best part is that FolkArt products are very affordable and readily available at Michaels stores. I'm extra-lucky here in Durham: there are two Michaels stores within ten minutes of my house! 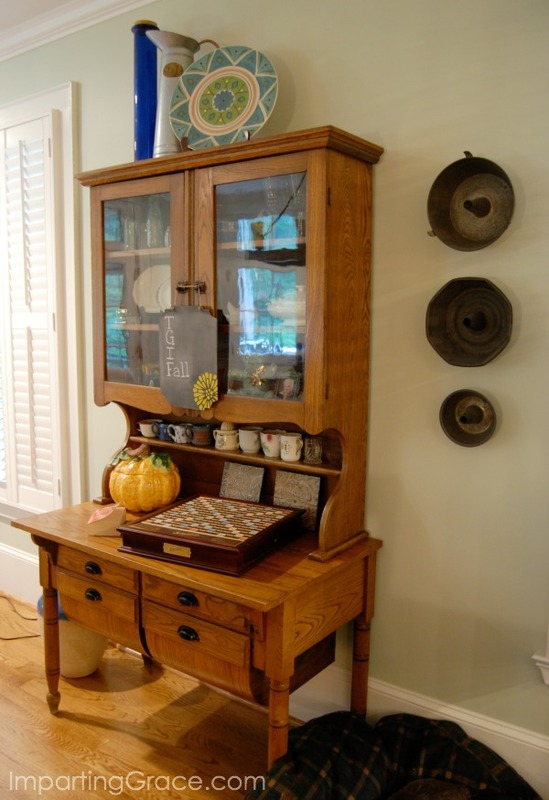 Have you created any fall decor this year? I'd love to see! Disclosure: This post was sponsored by Plaid with Blueprint Social. All opinions are entirely my own. Love it all dear Richella, specially the runner, it's lovely! Pretty arrangement for Fall too. I adore Fall décor! That is so cute, Richella! I have a few stencils and just recently used them to add some design elements to a chalkboard & a faux pumpkin that I painted with chalkboard paint. In my mind, I see this lovely, free-hand writing and scrolly work that just doesn't translate very well in reality!